You would have sworn it was Christmas. My girls were pulling items out of the box, shrieking in delight. My oldest daughter plastered a shirt against her front. “Isn’t it so cute, mama?” The little ones pulled out book after book, ooo ooo oooing in excitement. The box didn’t come from an online retailer promoting the latest kid trends and stories. It wasn’t from grandma, and it didn’t contain anything with tags. It was a cardboard diaper box full of hand-me-downs from a friend. We are the last in our group of friends to have kids, which means there are three girls older than my daughters who are passing down clothes, toys, and shoes. The items cover each of their little bodies for a season or two, and then time is up. The sleeves are too short. The hems lets cold air reach newly exposed skin. The clothing moves on. 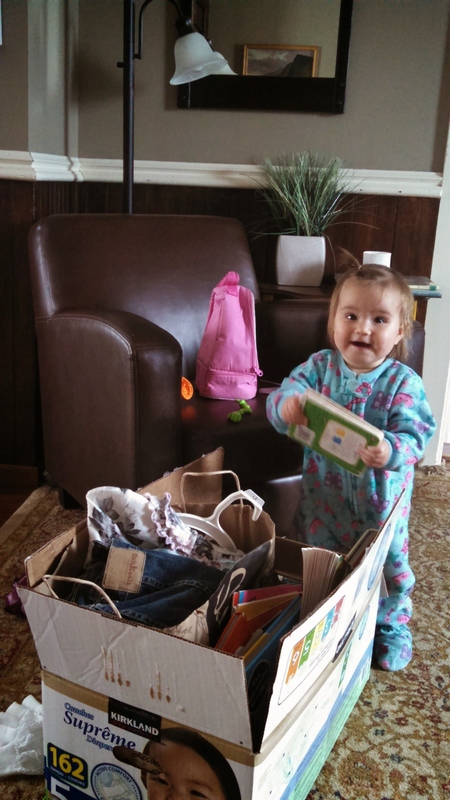 Lucia gets stoked about new books for the library. Something more is happening besides us rounding out our seasonal wardrobes. My daughter is learning the joy of sharing. She’s not thumbing up her nose at clothes with the occasional stain or shoes that are already worn. She simply recognizes that her friend was kind enough to share with her. Shouldn’t clothing warm us, body and soul? I get it. My girls are not trend setters. We don’t model the latest fashions in your Instagram feed. And you know what? I’m fine with that. 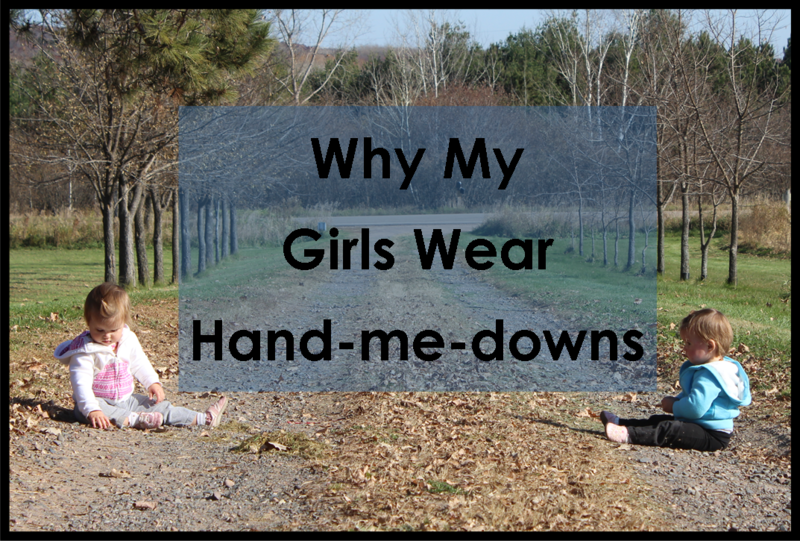 The lifestyle I’m sharing with my kids is one that doesn’t put too much value on what we wear. You know why? Play clothes actually get dirty at my house. And contrary to Oxiclean’s promise, grass stains and dirt streaks and paint splatters don’t always come out. Eggs get dropped on the way back from the chicken coop. Shoes that aren’t waterproof end up in mud puddles. But thankfully, I don’t spend my time caring for and worrying over the $38 on-trend sweater that’s now covered in ketchup and apple juice. I do my best to clean what I can, but at the end of the day, there’s no crying over ruined threads. Kids are messy, and I love letting them embrace that. It means they are exploring. Touching things. Dragging their knees through soft earth, feeling their way into the real world. Don’t get me wrong. I love the freshness of new clothes as much as the next girl. When my daughters need new things, or a few special occasion outfits, I’m more than happy to oblige. But for the bulk of their wardrobes, hand-me-downs are the perfect fit. At least for the next six months. Welcome to the season of giving, when it’s easy to think about stores and shopping and one-click purchases as the answer to every wish. But you know what I’ve been most blessed by? A neighbor who dropped off her son’s outgrown wooden train blocks and a couple of sleds. Or my friends, who’ve shared the clothes and dresses their sweet daughters bounced and danced in. Don’t underestimate what you have to give. Offer things your child is done with to a friend, a co-worker, the parents next to you at church, the woman you sit by on the PTO. The worst they can say is no, and the best they can say is a grateful, graceful thanks. This entry was posted in Attempted Parenting and tagged giving, hand-me-downs, playclothes, sharing. Bookmark the permalink.